Big Red Car here. So The Boss is in Steamboat skiing but he does a lot of work every day. He thinks of it as “working remotely” and it seems to work for him. Should a CEO try to do a bit of remote working and is it effective? 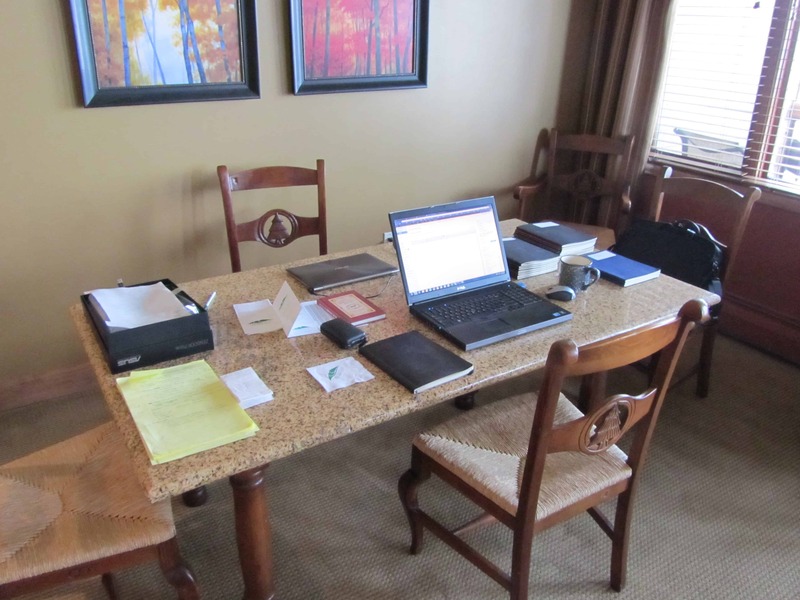 The Boss, even when he was running a public company, always thought that a good remote working location and a good equipment set up would enable him to get a lot of work done. The Boss operates under the notion that just about every day includes a bit of work and that a CEO can work on certain things from anywhere. 1. Be organized to actually work not to just surf around on your computer and pretend to be working. 3. Make damn sure you have the files and materials you need to work efficiently. The Boss is transitioning everything to the cloud so that smartphone, tablet, laptop, desktop can use the same files instantly. Here’s The Boss’s setup in Steamboat Springs. Big powerful laptop, small powerful ultrabook (can’t see it because it’s behind the laptop monitor), lazer mouse, digital camera and his topic notebooks (Moleskine, don’t you know?) and a bit of caffeine. Each project or client has their own notebook to keep stuff organized. 5. Work on the right subjects that are long on thinking. Also, you can make a lot of phone calls while working remotely. The Boss likes to use the audio capabilities of Skype for his phone calls. Hands free and great sound and all that jazz. Of course the real payoff is the ability to be where you can work and play efficiently and effectively. And why the Hell not? Working remotely! View from The Boss’s deck. Did I mention it’s snowing? This entry was posted in CEO, Excellence and tagged CEO, ceo remote working, remote working, working remotely. Bookmark the permalink. Read the book. Good for all but CEOs are a special case, no? Your blog post was and is EXCELLENT. Very comprehensive and thorough. No stone left unturned. you might also join a place like Nextspace.us, so you have an office where ever they are. Although, they are not in resort towns…yet. Cool. Those notebooks are heavy to carry, aren’t they? How about Evernote? Use the Hell out of Pocket and Evernote. Those Moleskines are for taking notes when Skyping. Thus when the next conversation takes place, it is easy to review where the conversation left off last time. Old School is sometimes Good School. Stay well and Merry Christmas. Keep crushing it with StartUp Management, Wm. 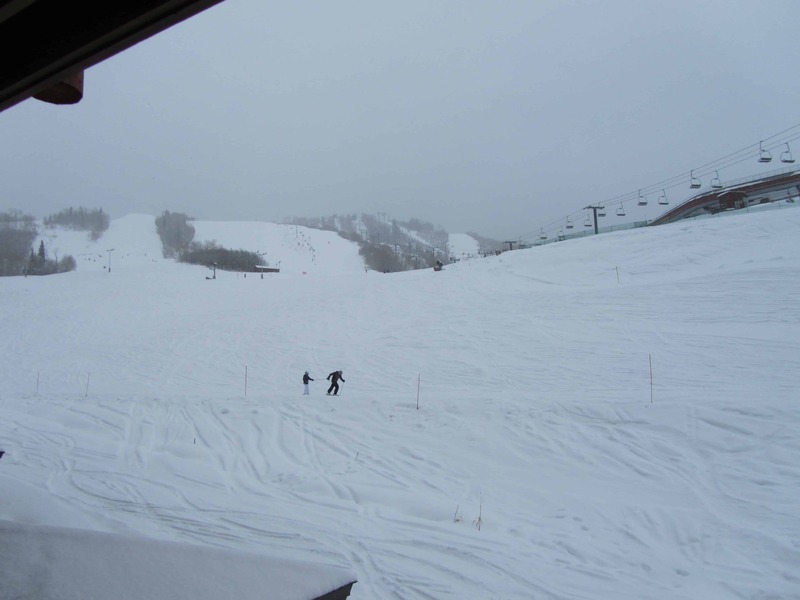 I haven’t yet had the opportunity to relocate to Steamboat but I live a little over an hr from skiing and get up often. The articles I want to read go to Pocket. I listen to them while driving using the text to speech feature. IFTTT send my favorites to Buffer for tweeting on schedule. People ask how I have time to read and share so much. The answer: I go skiing a lot.